Given the recent circus around Tiger's sponsors, it should come as no surprise that circus sponsorship itself is quite a risky proposition for many corporations. Last Fall, teen retailer Delia’s pulled Ringling Bros.-themed T-shirts from shelves following a campaign by PETA supporters. In 2007, Denny’s restaurants ended a major sponsorship with the circus following protests and mailings from PETA. 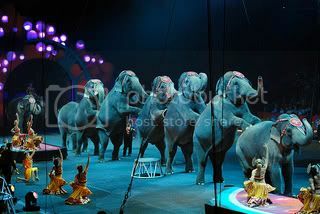 In 2004, Burger King followed General Mills and Ford in ending its sponsorship of UniverSoul Circus following negotiations with PETA. Even Britney Spears was called to task by PETA for the use of animals in her recent tour entitled Circus. Megan Grigorian, PETA circus specialist, called Neumann’s move to end the sponsorship great news stating “PETA and its 2 million members worldwide will celebrate this really kind and compassionate decision." Most recently PETA made an appeal straight to the White House firing off a letter that urged Barack Obama to take a stand against the debut of the Ringling Bros. circus' newest performing elephant, "Baby Barack." PETA says that Denny's, General Mills, Burger King, Liz Claiborne, MasterCard, Ford Motor Company, and Sears, Roebuck and Co., have all ended their sponsorships of either Ringling or UniverSoul circuses following negotiations with PETA. Ringling Brothers is owned and operated by Feld Entertainment, which in December had a nine year court case brought on by the ASPCA and other animal special interest groups, dismissed by a federal court. “Ringling Bros. is committed to ensuring the absolute best for its animals and those who care for them, including correcting any perception that may contradict our dedication to the care and management of the largest herd of Asian elephants in the Western Hemisphere,” said Janice Aria, Director of Animal Stewardship and Training, Ringling Bros. and Barnum & Bailey in response to one of PETA's recent cruelty allegations. So what does PETA, which runs the websites ringlingbeatsanimals.com and circuses.com, suggest an animal-friendly circus sponsor do? For one, Cirque du Soleil. The PETA blog states: "With awesome, creative animal-free circuses like Cirque Du Soleil delighting audiences around the country, there's absolutely no reason why a company looking to do a circus promotion would ever need to get into bed with Ringling Bros. It's outdated, it's unethical, and it's bad for business. And we'll do everything we can to make sure the world knows that."